PT Sampoerna Agro Tbk is one of Indonesia's leading producers of palm oil and palm kernel. It is a diversified plantation company that is engaged in the production of four main product lines: palm products, palm kernel products, germinated oil palm seed, and non-palm oil products consisting of slab rubber, and sago products. Sampoerna Agro is part of the Sampoerna Strategic Group, owned by the Sampoerna family. This group owns large stakes in the country's agri-business, telecommunications and banking sectors. Sampoerna Agro is an integrated and diversified agribusiness company involved in the production of four major commodities: palm oil, palm kernel, sago and rubber. Crude palm oil (CPO) and palm kernel account for over 90 percent of the company's total consolidated revenue. At start-2014, the company operated a total of 120,225 hectares of oil palm estates, 2,810 hectares of rubber estates, and 10,351 hectares of sago estates, mostly located on the islands of Sumatra and Kalimantan. Sampoerna Agro owns six palm oil mills (POM), five of which are located on Sumatra and one on Kalimantan. The POMs in Sumatra have a total production capacity of 380 tons of fresh fruit bunches (FFB) per hour, whereas the POM in Kalimantan has a capacity to produce 75 tons of FFB per hour. The company also owns a kernel crushing plant (KCP), located in South Sumatra, with a total installed production capacity of 150 tons of palm kernel per day and a sago processing mill, located in Riau (Sumatra), with a production capacity of 100 tons of starch output per day. Sampoerna Agro's palm estates in Sumatra cover an area of over 85,000 hectares, most of which comprise producing oil palms with an average age of around 13 years. Approximately 48 percent of the areas constitute nucleus estates while the remaining areas involve smallholder estates known also as plasma estates. In South Sumatra, the company operates a productive rubber estate of over 200-hectares, with access to a further additional landbank of 100,000 hectares in West Kalimantan which is planned to be developed (mostly) into rubber estates. Roughly 90 percent of Sampoerna Agro's CPO production is sold on the domestic market, the remainder is exported (mostly to Singapore). 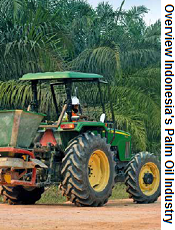 Visit our Palm Oil in Indonesia section to read more about Indonesia's palm oil industry.